A CEO from one of the world’s top five global fashion brands needs to work just four days to earn what a garment worker in Bangladesh does an entire lifetime, a new Oxfam report finds. ’Reward Work, Not Wealth’ reveals that 82% of the wealth generated last year went to the richest 1% of the global population, while the poorest half (3.7 billion people) saw no increase at all. Last year saw the biggest increase of billionaires in history, with one billionaire created every two days. This huge increase could have ended global extreme poverty seven times over. This is not a sign of a thriving economy but a symptom of a broken economic system and nowhere are the fractures more visible than in the global garment industry. In 2013, Bangladesh suffered one of the worst industrial incidents in history following the collapse of Rana Plaza, which left over 1,120 workers dead. But five years on, low wages and dangerous work conditions persist. Despite generating over 80% of the country’s total export revenue, garment workers in Bangladesh earn as little as 5,300 taka (£54) a month – one of the lowest minimum wages in the world. 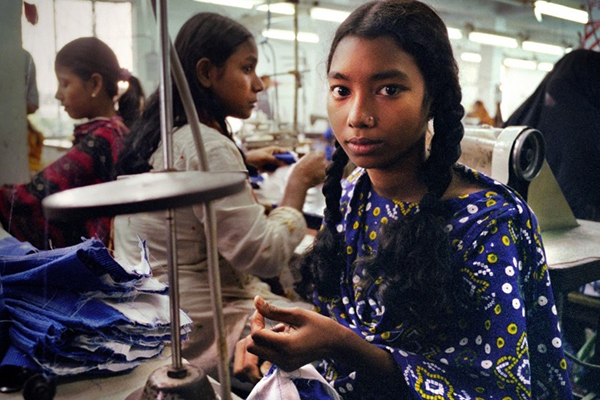 Due to inflation and rising living costs, Bangladeshi garment workers, most of whom are young women, struggle to feed their families each month and find themselves in constant debt. Living wages and decent work are fundamental to ending today’s inequality crisis. Whilst historically, unions played a role in helping workers bargain for a better deal, today the hyper-mobility of capital renders them powerless. Last year, at least 1,500 workers were sacked after protests over pay erupted across Dhaka. Dozens were arrested amid violent clashes with police, as workers demanded a fairer wage. Earlier this month, Bangladesh’s Labour and Employment ministry formed a panel to discuss the revision of the worker’s minimum pay. “The committee will file a report with its recommendations in six months, after which the government will finalise the new wage structure,” State Minister Mujibul Haque said. Whether or not this will be enough for workers to survive on is something that should concern us all – consumers, world leaders, and particularly CEO’s of global fashion brands. International pressure must be applied to ensure workers receive a fair minimum wage. This isn’t a question of ‘corporate social responsibility’ but one of basic human rights. Previous StoryWE’RE TAKING PART IN ISDB’S MADRID FINTECH CHALLENGE!